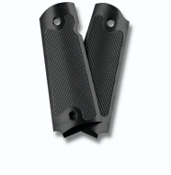 “Slimline 1911 Checkered Grip”, provides the strength and durability as the Standard Grip, due to it’s solid aluminum construction which will provide years of hard tactical use and not show any signs of wear or tear. Full checkering enhances the control of the handgun, while the faultless border pattern, timeless lines and square edges add an elegant appearance. The fully functional checkering will not abrade clothing while still proving a secure grip while the new slimline design provides a thinner grip which reduces overall gun weight and added ease of concealment.